Calling all nature and wildlife lovers! 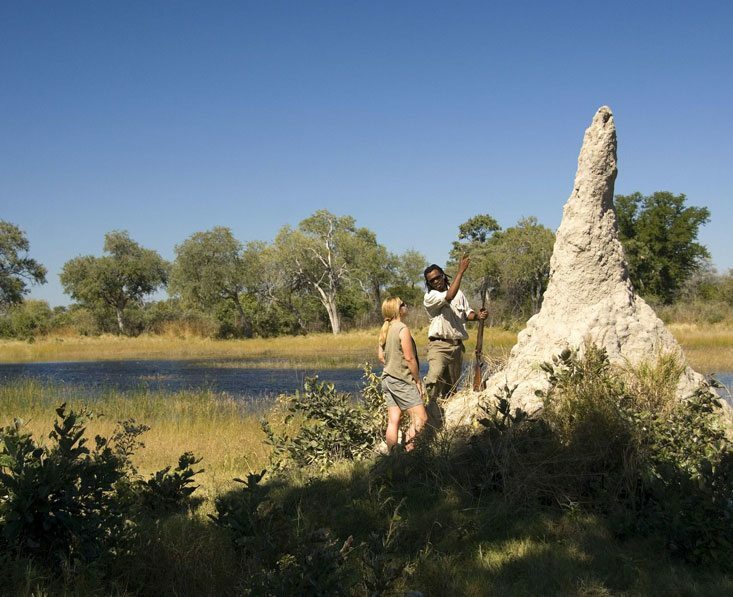 This high quality group safari takes in 3 renowned wilderness areas. You’ll explore by 4x4, boat and on foot for an excellent all-round experience. 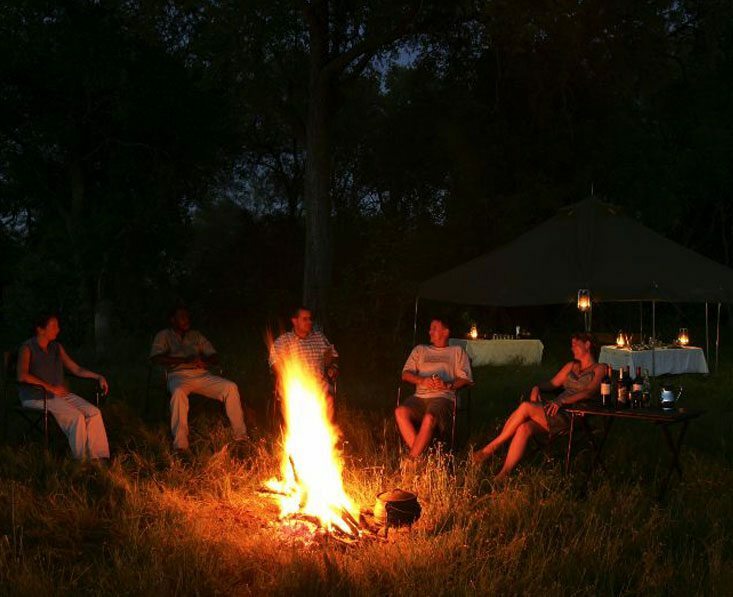 You can’t get closer to nature than camping, eating out in the open, enjoying drinks round the fire and falling asleep to the sounds of wild Africa. You simply won’t want this adventure to end. You’ll be met on landing in Maun and shown to your roughly 2pm flight to the Xakanaxa airstrip in Moremi (30 minutes). Here you meet your guide who will drive you to the camp. Staff will have prepared the camp, so settle in then join fellow travellers for a chilled drink. You’ve arrived in Africa! (Note: If you’d prefer to have a more leisurely start, talk to us about planning a day in Maun before the mobile safari begins). Dinner. Day 2: The safari adventure begins today. 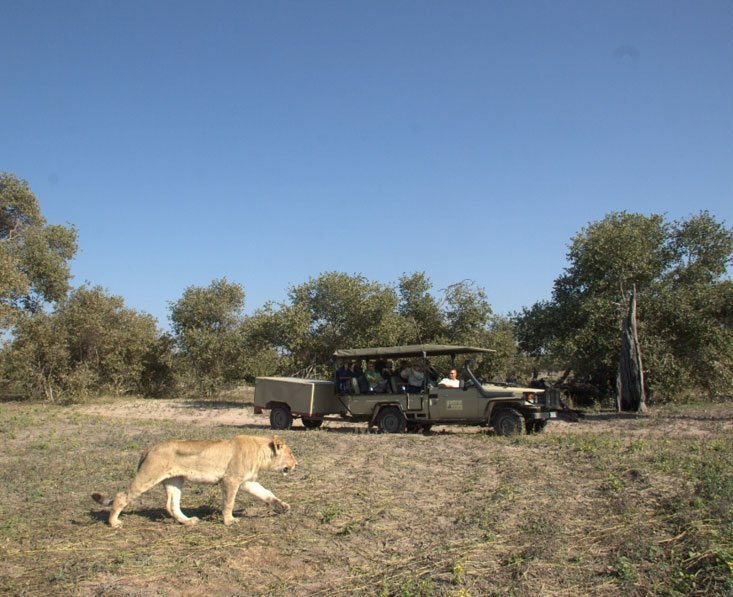 The Xakanaxa region of Moremi Game Reserve has varied terrain that is attractive to a wide range of wildlife, and with your guide’s expert help, you should have many memorable sightings today. You’ll set out in the early morning, returning to camp to sit out the midday heat, and again in the afternoon, for exciting 4×4 game drives. Full board. Another exciting day’s game viewing dawns in Moremi Game Reserve in the Okavango Delta. Elephant, buffalo and dainty lechwe are usually seen in large numbers on the plains, while hippos frequent the water. Your guide will also point out smaller creatures and identify the many birds. 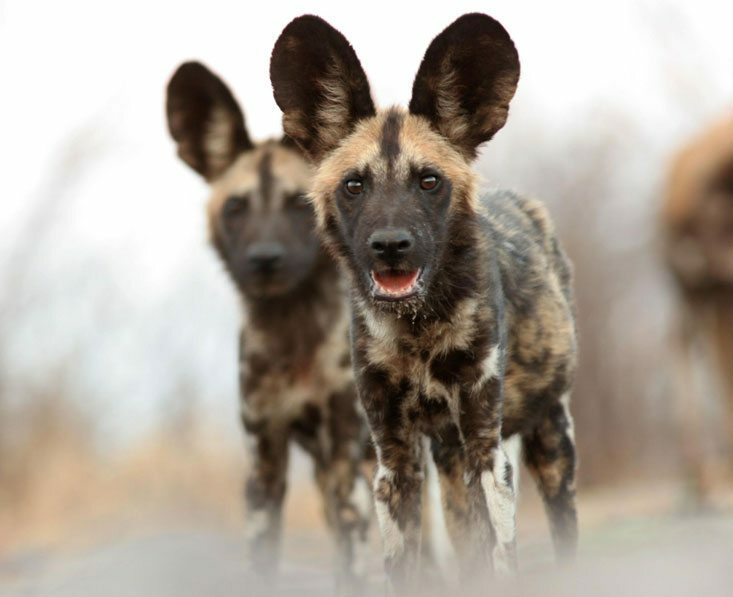 If you’re lucky you may encounter wild dog, for many a real safari highlight. Back in camp tonight you’ll enjoy dinner and a nightcap by the fire. Full board. Day 4: Today you have an early breakfast followed by a game drive heading northeast to the Khwai Community Area (about 3-4 hours depending on sightings). The area is well known for hippos and some impressive old bull elephants, and you can also hope to spot giraffe, zebra and antelope plus lion, cheetah and leopard. Later, having reached your new camp, you’ll have the chance to go for a night drive, seeking out shy, nocturnal creatures. Full board. 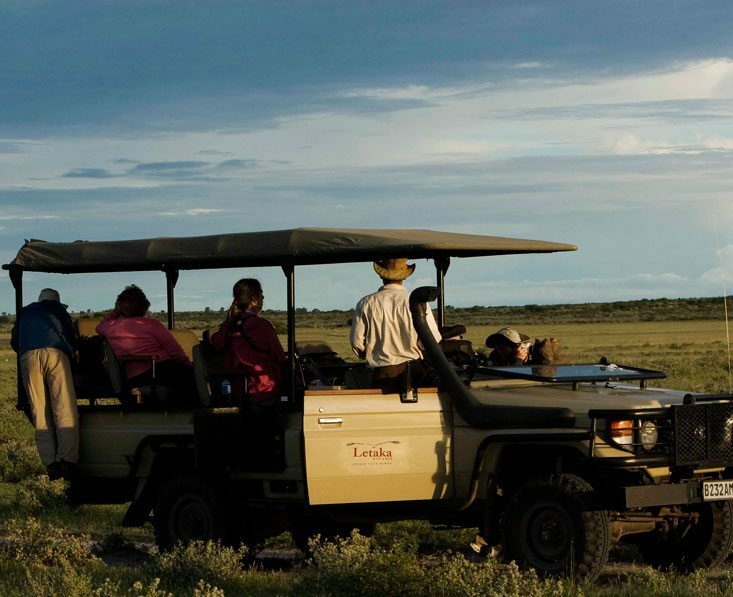 As well as game drives you could set out on foot with your armed guide, allowing you to get truly close to nature. 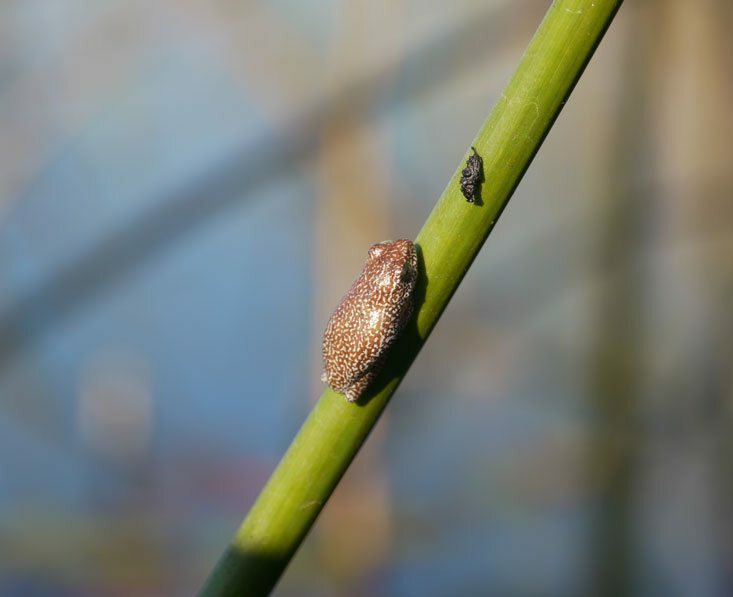 This is an absorbing and enlightening experience as you learn about the intricacies of the ecosystem and get to view small animals, insects, birds and plants in detail. You’ll be left with an enhanced understanding of the regions flora and fauna. Full board. This morning you might opt for leisurely mokoro ride (water levels permitting). Relax as your poler/guide directs the canoe through narrow channels, giving you time to appreciate the beauty of the scenery and look out for birds and tiny, delicately patterned reed frogs. Having rested and lunched in camp, take a game drive a little further from the camp to spot big game. Full board. 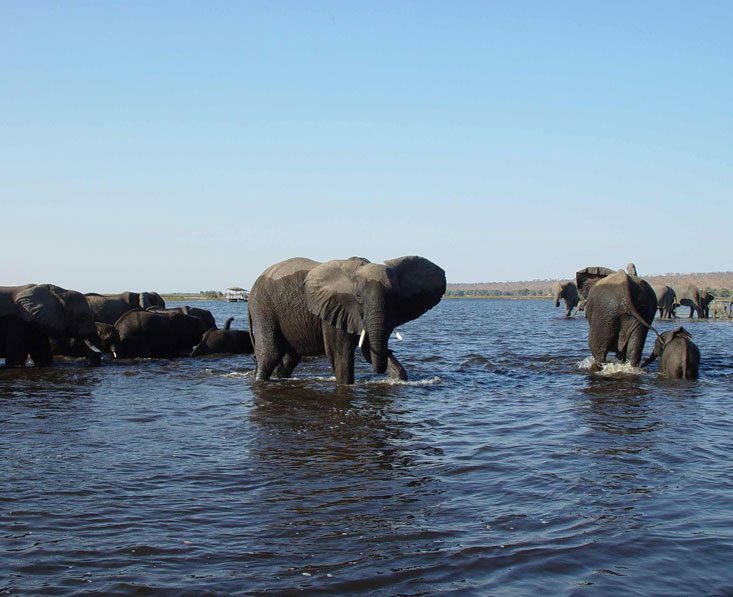 It’s time for a change of scene as you head for Chobe National Park. 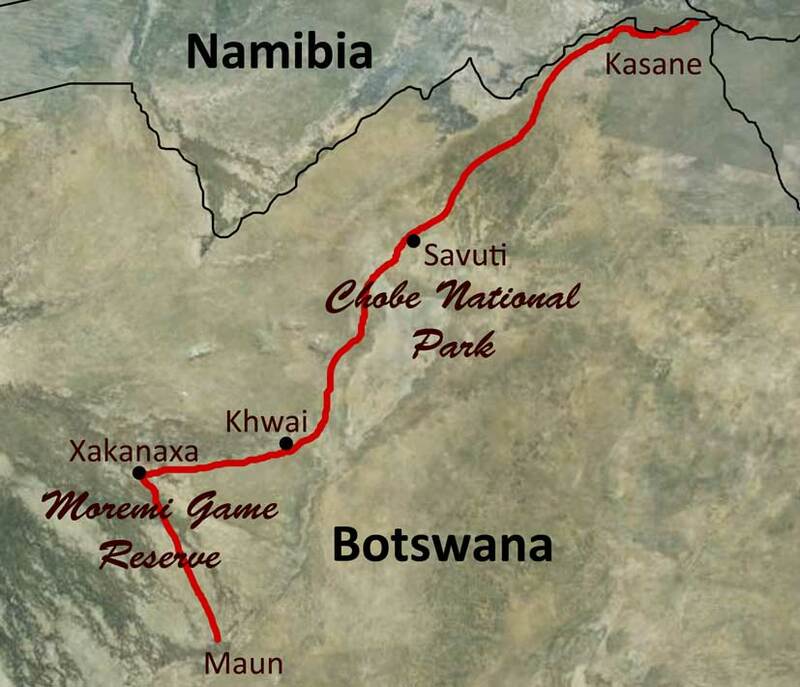 The drive will take about 4-5 hours, including crossing the Magwikwe sand ridge. This is an area rich in bird life. Your journey continues through varied habitats so you’ll have chances to see diverse wildlife. Keep your eyes peeled for lion and cheetah. 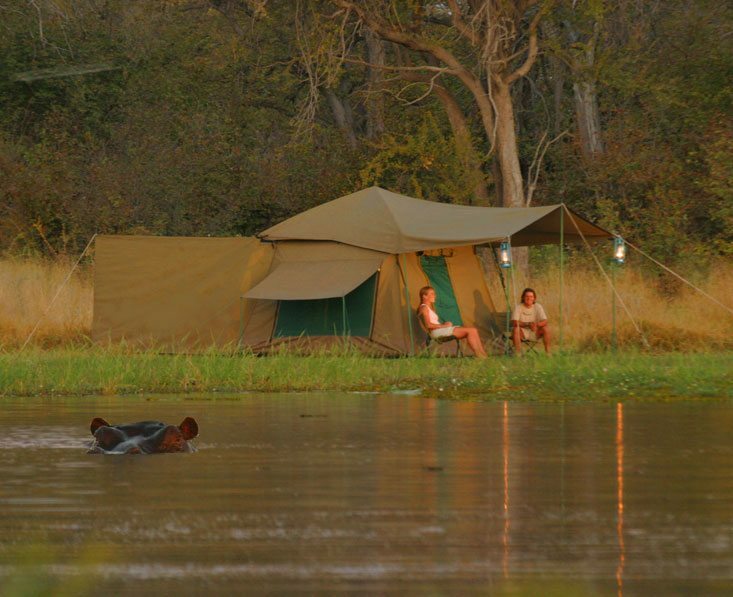 You’ll reach your camp in the Savute region of Chobe in time for a shower and drink before dinner. Full board. Day 8: You’re in for a treat with varied topography and wildlife today. The landscape here features large rocky outcrops and hills that are home to many small animals, birds and plants not seen on the plains. Savute Marsh, meanwhile, is known for concentrations of elephant and lion and you may witness some exciting hunting action. Cheetah, hyena and wild dog are among other predators you may see here. Full board. This morning you might like to visit some local San Bushman paintings found in the hills. As you view the depictions of familiar-looking animals and human figures it’s amazing to think that these were created over 3,000 years ago. This afternoon there’s another Savute safari. No two drives are the same and you won’t be disappointed! Tonight you’ll have your final dinner in camp, as you look back over the many highlights of the last few days. Full board. Day 10: Leaving camp after breakfast you’ll head through Chobe Forest Reserve and along the Chobe River, game viewing en-route. 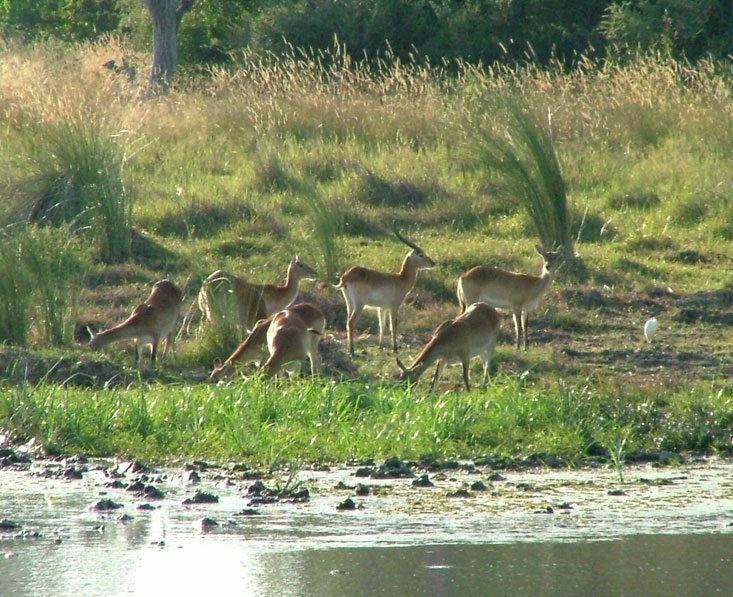 You’ll reach Kasane, the town near Chobe, in time for a tasty picnic lunch. Later you’ll be treated to a boat ride along the river, a wonderful way to end your Botswana safari. We recommend that you either stay here in Kasane for tonight, or you could travel across the border to Zambia or Zimbabwe, to pay a visit to the incredible Victoria Falls – just ask us to help you with this. Breakfast, lunch. This trip operates northbound from Maun to Kasane. You will need flights into Maun and out of Kasane (or out of Livingstone in Zambia, or Victoria falls in Zimbabwe – both of which are only about 1½ hours from the end point of Kasane). From the UK, we recommend getting a flight with a combination of British Airways, Air Botswana and/or South African Airways via Johannnesburg. A rough price guide per person would be £900 – £1400 in economy depending on the season. There are also some special photographic workshop departures. Please ask us for details. International flights and taxes, visas, vaccinations, travel insurance, drinks at accommodation other than the tented camps, toiletries, personal expenses, tips. This group safari is run by Letaka Safaris. 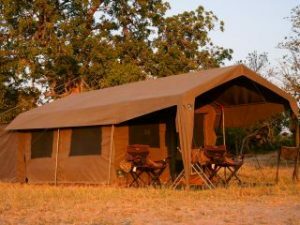 It operates group mobile camping trips in Botswana to a very high standard. 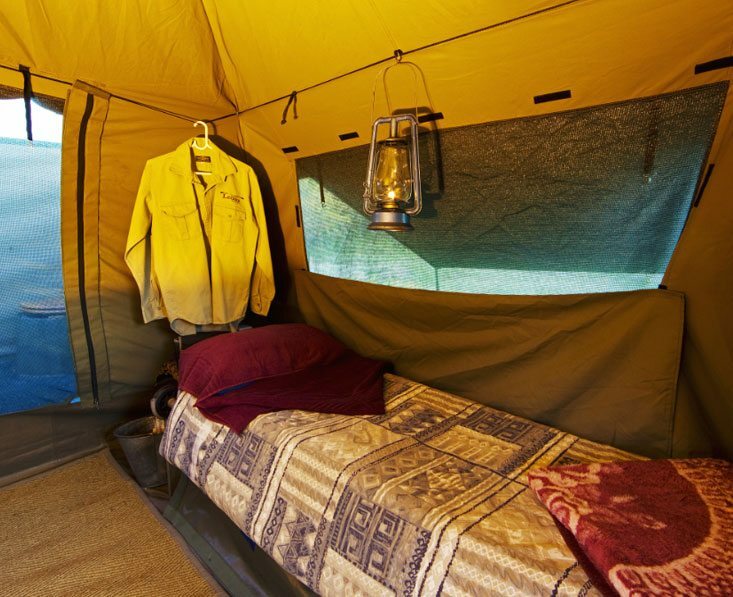 Yes, this is a camping trip, but you will be fed very well, and accommodated in comfort. 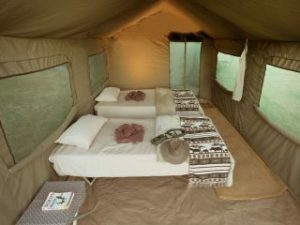 You have a large walk-in sahara style tent with sturdy solid camp beds (with good mattress and all linen and towels included) and a shaded ‘verandah’ with camping chairs to the front and a small en-suite bathroom area through a zip door at the back. Water is heated as needed on camp fires for your bucket shower and there is a portable toilet. While you are out on games drive your highly skilled camp staff prepare excellent meals, including freshly baked bread. Dine under the stars at proper tables with good South African wines to wash down a sumptuous three course dinner then sit round the camp fire with a nightcap. 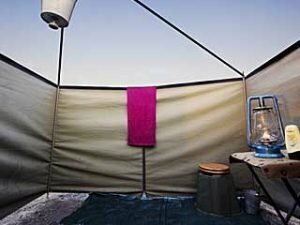 Mess tent shelters are erected in camps for shade and weather protection.